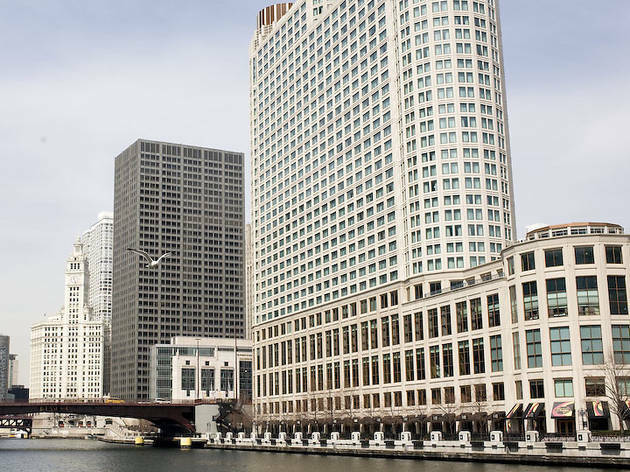 Think you already know the tales behind Chicago’s tallest buildings? Think again. 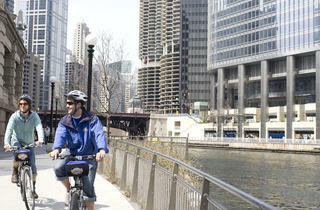 Photograph: Martha WilliamsSkyscraper Bike Tour, Marina City stop. 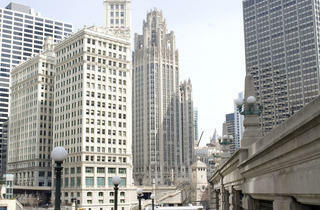 Photograph: Martha WilliamsSkyscraper bike tour, Wrigley Building and Tribune Tower. 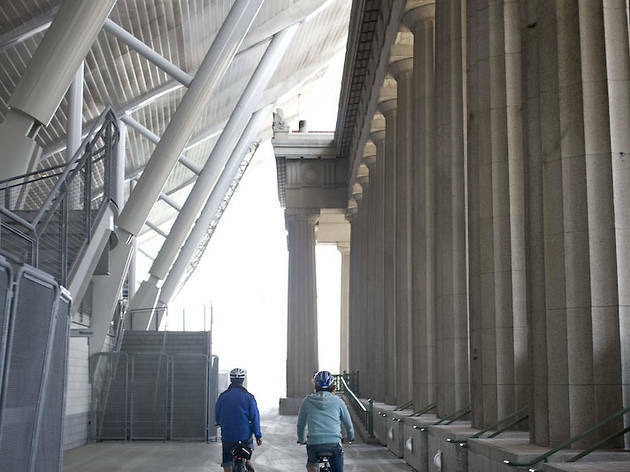 Photograph: Martha WilliamsSkyscraper bike tour, along the river. 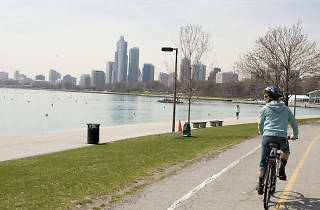 Photograph: Martha WilliamsSkyscraper bike tour, lakefront path looking South. Photograph: Martha WilliamsSkyscraper bike tour, lakefront path view of Museum Campus. 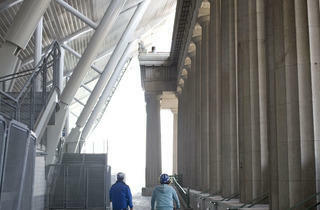 Photograph: Martha WilliamsSkyscraper bike tour, Soldier Field. 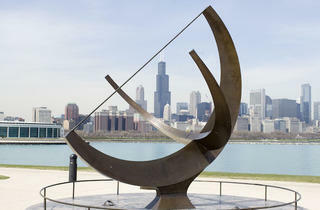 Photograph: Martha WilliamsSkyscraper bike tour, massive sundial at Adler Planetarium. It’s a beautiful day in early spring (yes, we actually had two of those this year) and I have to admit, I’m looking forward to the bike ride ahead of me more than the tour guide’s spiel. 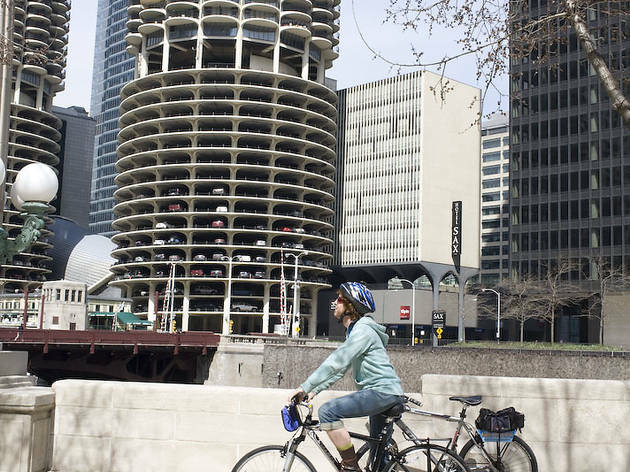 As a Chicagoan who’s been on similar tours by boat, I wonder how interesting this look at the city’s skyscrapers can possibly be. Turns out, while it’s ideal for newcomers, it offers plenty for us natives, too. Led by Brian Lewis, who has a master’s in architecture from the University of Illinois, the journey teams facts I’d never heard with those I’d forgotten. 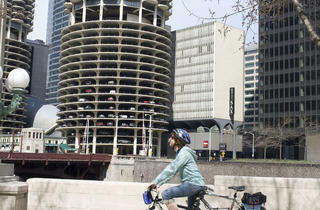 Like: Marina City, built in the early ’60s, was “designed to prevent suburban migration” (a.k.a. white flight), Lewis says. 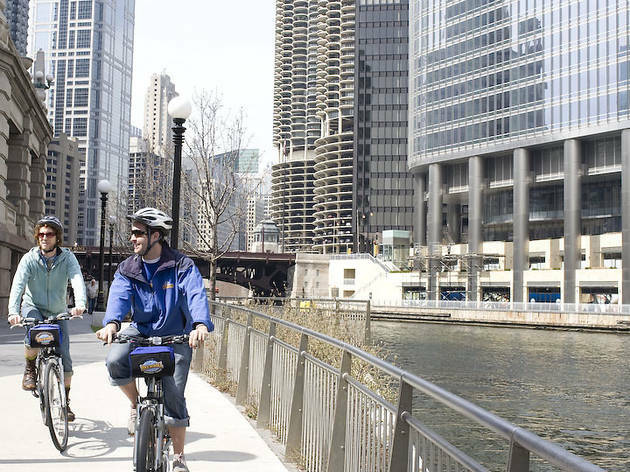 SPANISH ACQUISITION We ride from Wacker Drive and Wabash Avenue down to the river level below Michigan Avenue and pedal slowly toward the lake. 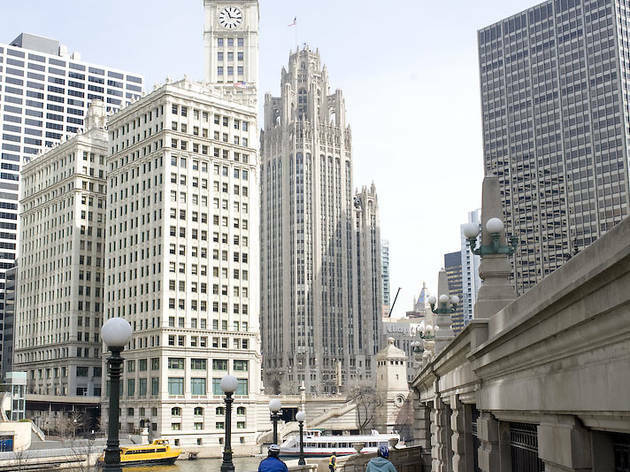 Lewis points out the Wrigley Building, with its design inspired by La Giralda, the 343-foot bell tower of the Seville Cathedral in Spain; and the Tribune Tower, the result of an internationally influential design competition held in 1922. SHORT STUFF We head toward Museum Campus along the lakefront, where the talk veers from tall buildings to other iconic structures, such as Buckingham Fountain (meant to recall the features of Versailles) and the Field Museum (designed by Daniel Burnham, who was criticized by up-and-comers like Louis Sullivan for his throwback designs). NUMBERS GAME We pause by the Adler Planetarium at the eastern tip of the campus peninsula, which Lewis says provides the best view of the skyscrapers in the city. Here, our guide shares a few final facts about our tall boys. 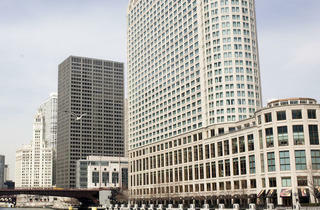 He says that during the Aon Center’s early days in the ’70s (when it was called the Standard Oil building), it was clad in white marble, which proved a disaster when it cracked and chunks fell off. (It was eventually replaced by granite at enormous cost.) “Somebody probably got fired over that,” he remarks wryly. The Willis Tower, he continues, infamously lost its tallest-in-the-world title to Petronas Towers in Malaysia in the late ’90s. 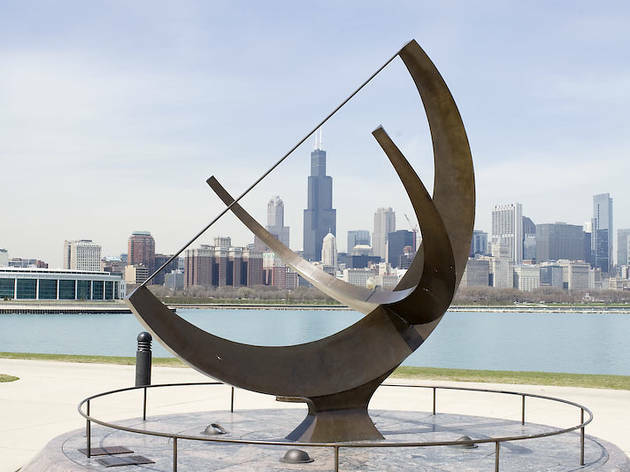 But he notes that “if you averaged the heights of the ten tallest buildings in Chicago” and compared that against other cities’ averages, “we’d have the tallest in the world.” Ah, statistics: You can prove anything if you crunch the numbers the right way.